Super Human Radio - Show #815 - The Extraordinary Side of Aging - 9/15/2011 - Here in the USA we often do not embrace the idea of aging and we thus fail to see the value in our older adults. 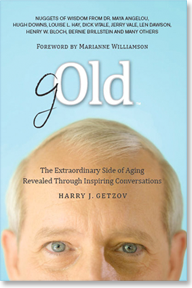 Harry J. Getzov has compiled compelling interviews with individuals who have maintained their spirits while aging and who can teach us all a thing or two about aging with vigor and excitement. Super Human Radio is the world's first broadcast radio show dedicated to fitness, health and anti-aging. Judyth Piazza Strikes gOLD with Harry J. Getzov on The American Perspective - 7/3/2011 - Harry J. Getzov visits with older people - lots of them. Building on his genuine love for listening to and learning from people in individual and small group settings, Mr. Getzov visits and writes about his experiences with senior citizens from all walks of life as part of the Eldercation® project he created in the early 1990`s. A hobby turned career, Eldercation® was born out of Mr. Getzov`s long-standing passion for tapping into this precious sector of our society. Interesting Elders - As the baby boomer generation and their parents grow older, find out what senior citizens are doing to stay active in the community and learn about a national project to collect stories from interesting elders around the country.